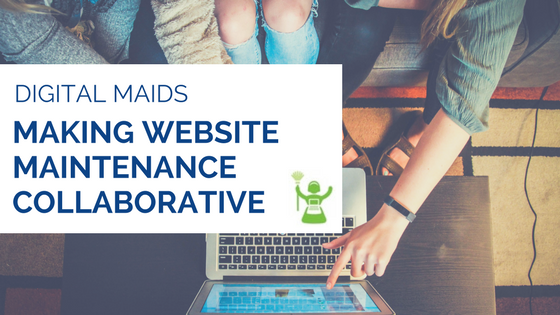 Website maintenance should be a collaborative effort. Employees add value to a company website, and a strong digital presence often translates into a healthy business. However, corralling content from various stakeholders is challenging. Particularly when there is little or no process in place. This is where a good file sharing app such as Google Docs or Evernote can help you meet your website updating goals. Take advantage of the ease and convenience of file sharing apps to involve key content holders in the website updating process. This does not mean you need to hire additional people to do the actual updating of your website. File sharing apps are a tool for the content providers and web professional to communicate. These apps offer a convenient, streamlined approach to organizing and prioritizing content updates. Even small businesses have multi-content providers. The perspective of a specific job role or position within a business brings with it a unique set of content and knowledge- and some of that content is valuable to the website. A sales team member will most likely have first-hand knowledge of pricing or product descriptions, while an HR person can be a huge asset in fleshing out staff bios and images. Capturing all of these varying perspectives and nuggets of company information with a seamless, trackable process can dramatically improve the quality and freshness of your website. I have worked on and off for two years with a nonprofit that has a staff of approximately twelve people. Identifying which employee had the correct, updated content needed for the website was an ongoing issue. Some staff worked remotely, some worked multiple roles. Individual requests for content became an endless, an ultimately fruitless cycle. Under new leadership, ensuring an updated website was high on the priority list. After a few long email threads, Google Docs was suggested as a solution to manage and track website updates. After carefully creating a document that was easy to access, understand, and update, we started to see progress. A shareable, breathable list of what the website needed, was in fact, exactly what the website needed! We were able to quickly document website pages, paragraphs, or even single sentences that required attention. With a clearly designated “Status” column in Google Docs, all involved in the process could see what needed to be done, who was responsible, and what had already been accomplished. Greater visibility and providing a convenient way to communicate updates significantly reduced the time getting the content, confirming it was the right content, and having it posted. There was great satisfaction in seeing results! Everyone has to be looking at the same content! Some website content is nice-to-have, some is time sensitive and must-to-have. Communicate time sensitivity and your web person will know what to do first.